The SAMSET Project hosted its second continuing professional development course at Victoria University in Kampala, Uganda from the 7th – 11th November 2016. The title of the course was “A Practitioner’s Insight into Urban Energy Planning, Implementation and Management”, and aimed to cover the issues that practitioners (such as urban planners, architects and municipal government officials) face when addressing urban energy management. The first day of the course was focused on fieldwork in and around Kampala, aiming to give attendees experience of the issues facing Kampala in the urban energy and sustainable energy spheres today. 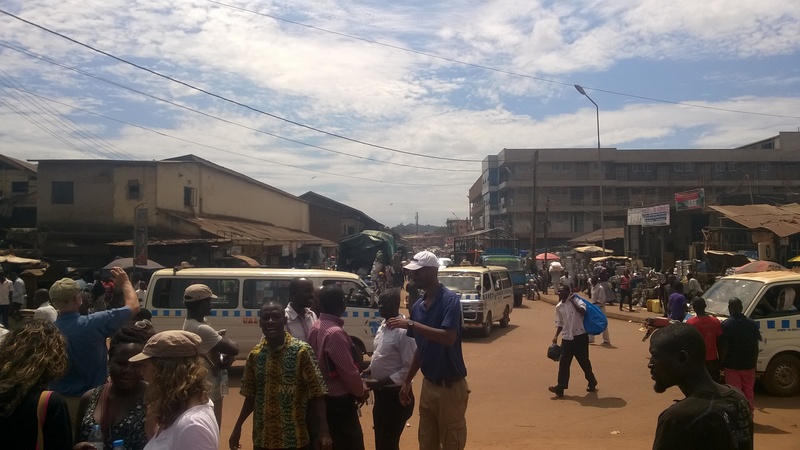 The first part of the fieldwork focused on the central market district in Kampala, and involved a walking tour led by local partners through the market area and central business district of the city. To say that the market area in Kampala is busy is an understatement. Passage through the area is only really possible on foot in some places, and even then only when avoiding the constant movement of goods and people through the narrow streets of the market district. The main roads in the area are extremely busy, with heavy goods vehicles mixing with matuba taxis and boda-bodas (motorcycle taxis) to create effective gridlock at some points in the day. The sustainable energy market, however, was on show in many areas, whether that be hole-in-the-wall shops selling small solar home systems, to street vendors selling improved cookstoves and cookstove liners. The challenges to urban transport were clear to see in the area, particularly how best to facilitate the movement of goods and people in the centre of the city, without stifling the bustling engine of economic growth that the central market district provides to the city. 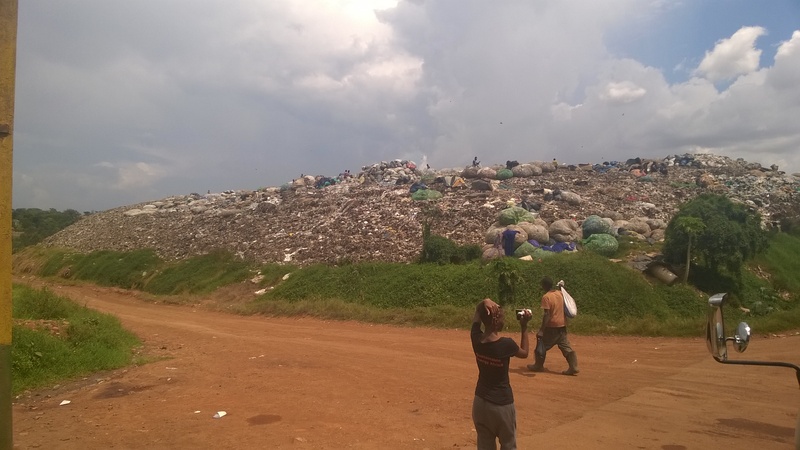 The second phase of the CPD course fieldtrip involved a visit to a local landfill site on the outskirts of Kampala. This site processed a significant amount of the solid waste in the city, including from official waste management collection services and informal networks of waste collectors. The site also supports a network of informal waste pickers and processors, collecting items such as plastic waste for recycling. A recent initiative at the landfill has seen a PTFE processing facility constructed through collaboration with Chinese investors, although this site has not been without issues. In particular, while investment in the processing facility has created employment at the site, redistribution of profits from the facility has not occurred, with very little being reinvested in the site or community of waste pickers servicing it. The issues facing solid waste management in large, primary cities such as Kampala are myriad, and the effects of this were plain to see in this phase of the trip. Collection and processing, as well as sustainability in operations, are both issues that need to be addressed by urban planners when considering municipal waste issues. This entry was posted in UCL - Energy Institute and tagged Course, CPD, Education, Energy Transitions, Fieldwork, Kampala, Management, Municipal Government, SAMSET, Solid Waste Management, Sustainability, Sustainable Energy, Sustainable Energy Transitions, Transport Planning, Uganda, Urban Commerce, Urban Energy Transitions, Urban Transport on December 7, 2016 by danielkerrucl. The SAMSET project team is pleased to announce the hosting of the Strategies for Sustainable Energy Transitions for Urban Sub-Saharan Africa (SETUSA) Conference, which will be held at the Institute of Statistical, Social and Economic Research (ISSER) Conference Facility, University of Ghana, Legon, Accra, Ghana from the 19th – 20th June 2017. Given these challenges on sustainable development, solutions for sustainable energy transitions in the Sub-Saharan African region are extremely important, and likely to have wide-ranging consequences on the sustainability of the region’s economies. This reality also imposes an urgent obligation on the continent to consider sourcing more of its abundant renewable energy resources to ensure long-term security of energy supply. Particularly, renewable energy resources — solar, wind, organic wastes – and their corresponding technologies offer more promises for sustainable energy futures than the conventional energy sources. Therefore, there is the need first of all to raise awareness on renewable energy options and energy efficiency opportunities in urban areas, and to promote strategies which will maximise their benefits in providing secure, sustainable and affordable energy to meet the rising energy demand in the region’s fast-growing cities. Secondly, there is also the need for national as well as local government planners and policy makers to understand local urban contexts so that they can grasp the significant opportunities of engaging at a local level, as well as acquire the critical set of capacities and skills necessary to drive and influence the uptake of clean energy and efficient technologies. The conference aims to bring together social scientists, policy-makers and entrepreneurs in the urban clean energy sphere, to discuss strategies for moving Sub-Saharan African economies to a more sustainable energy transition pathway. We are inviting papers on energy efficient buildings, energy efficiency and demand-side management in urban areas, renewable energy and energy supply in urban areas, electrification and access to modern energy in urban areas, waste to energy in urban areas, spatial planning and energy infrastructure in urban areas, energy and transportation in urban areas. This entry was posted in ISSER - University of Ghana and tagged Africa, Buildings, Conference, Developing World, Electrification, Energy Efficiency, Energy Transitions, Infrastructure, Municipal Governments, Planning, Policy, SAMSET, SETUSA, SETUSA 2017, Sub-Saharan Africa, Sustainable Energy Transitions, Transport, Transportation, Urban, Urban Governance, Urban Policy, Urbanisation, Urbanization on August 26, 2016 by danielkerrucl. Mark Borchers, Megan Euston-Brown and Melusile Ndlovu from Sustainable Energy Africa recently contributed this post to the Urbanafrica.net Urban Voices series, analysing the role of local government in sustainable energy transitions. The original is reproduced in full below. African local governments have an important role to play in sustainable energy transitions, yet the ability within local governments to step into this role is severely inadequate. This is problematic because municipalities, in close contact with their citizenry, are often better placed to plan and respond to energy needs in locally appropriate ways than national governments or other ‘external’ agents. Urbanization rates in Africa are amongst the highest in the world and the municipal capacity to undertake minimum levels of urban planning and basic service delivery is severely inadequate, as acknowledged by the African Development Bank, UNHabitat and Cities Alliance. A major challenge is that local government is poorly understood by those trying to be agents of change, and research often remains at a superficial level. Even work which specifically aims at going beyond the usual ‘vague policy suggestions,’ to use a phrase from the ACC’s Edgar Pieterse, struggles to get to grips with many key local government dynamics, and the number of outputs produced by consultants or researchers with local government as an intended target audience, which have little or no purchase, is worrying. Non-profit Sustainable Energy Africa’s experience of working in partnership with local government in South Africa for 17 years to support with sustainable energy transitions affirms this. The organization has provided capacity to local government in areas where government did not have experience, staff or systems, and in an environment where officials are often preoccupied with short-term service delivery and other urgent goals displace longer-term considerations such as those linked to climate change mitigation. Sustainable Energy Africa has spent years supporting several municipalities in the development of energy and climate change strategies. However, after official approval of the first few strategies, it started becoming apparent that the momentum that had led to strategy finalization rarely continued into implementation. For example, the first set of strategies developed in the municipalities of Cape Town, Sol Plaatjie, Ekurhuleni, Buffalo City and Tshwane struggled to gain significant traction. What followed was many years of supportive partnership with municipalities: participating in meetings, undertaking research in areas where there were concerns, developing specific motivations for political or other vested interests as they arose, engaging with city treasury to raise their awareness and explore workable revenue futures, exchanging lessons and sharing success stories amongst municipalities, and raising the profile of local issues in national fora and strategies. Sustainable Energy Africa’s experience has demonstrated that the work involved in getting to the point of having an officially approved energy and climate change strategy is but a small fraction of what is required for any real change to gain traction. Unfortunately, the dynamics that impede efforts to bring the strategy to fruition are often poorly understood by development support institutions (including donors) and researchers. Guidelines and resource documents on urban transport policy development, climate proofing of informal settlements, and energy efficiency financing, to give a few examples, are often of little use to local government. Research focusing on dynamics affecting service delivery and assessments of renewable energy options for urban areas, for example, seldom talk to the constraints and pressures that senior officials encounter on a day-to-day basis, and thus tend to have little impact. It is not surprising that adequately detailed understanding of local government is lacking, precisely because it is difficult to gain useful insight into this world from normal development support programmes, which may last a few years and often involve imported expertise, or from research projects, even if they are methodologically well considered. To illustrate, about 10 years ago work undertaken by development support organisations and researchers pointed to solar water heaters being economically, socially and environmentally beneficial for application across South Africa’s urban areas. Cost and technical feasibility studies were undertaken, presentations made, guidelines produced, case studies circulated, and workshops held. Introducing solar water heaters was considered by many to be a ‘no brainer’, and was a standard feature of all municipal energy strategies developed at the time. Yet over the years little changed. Within municipalities there were staff capacity barriers, institutional location uncertainties, debates around mandates, political ambivalence, and a good dose of plain old resistance to change. When one of the most progressive South African municipalities finally developed a detailed solar water heater rollout programme, further obstacles had to be negotiated: it ran foul of the city treasury (it threatened electricity sales and thus revenue), electricity department (impact on the load profile, technical issues and revenue), procurement department (selection of different equipment service providers), housing department (roof strength issues of some government housing), and legal department (ownership of equipment and tendering processes), which further delayed progress by several years. Other sustainability interventions such as energy efficiency in buildings, renewable electricity generation and densification (an important enabler of sustainable transport options) all face their own mix of complexities, most of which are difficult to know from the outside. Change in government institutions seldom happens fast. When those hoping to be agents of change better understand the complexities of municipal functioning, transformation can be more effectively facilitated. Supporting local government often means entering an uncomfortable, messy, non-linear space but it can be more effectively done than often happens. In many ways, what is required is an inversion of the usual approach: support agents or researchers need to respond to the specific, not the general; listen, not advise; seek to be of service rather than pursue a preconceived agenda. The focus of the lens needs to shift well beyond general observations on ‘local institutional capacity’, ‘reform of regulatory systems’ or ‘policy impasses’. What is needed is a much more detailed, nuanced, and longer-term understanding and set of relationships for more impactful engagement. Through applying these approaches, Sustainable Energy Africa’s work in South Africa has helped local government move from being considered irrelevant to the energy field 10 years ago to being regarded as critical agents to a sustainable energy future today. A recent independent review of Sustainable Energy Africa’s local government support programme points to its success. It is described as, amongst others, having a clear role in the development of nation-wide city energy data, in facilitating energy efficiency programmes in different sectors in several municipalities, in promoting renewable energy (often rooftop solar PV) in several major cities, and in institutionalizing sustainable energy and climate change issues within municipalities. Drawing on the above experience, the SAMSET project is working with African municipalities at a detailed level in partnership with universities and development organisations in Africa and the UK, and six municipalities in Uganda, Ghana and South Africa. This collaboration walks the full process of systemic change with the municipalities, and focuses the lens of research and implementation support on this inadequately understood, yet critical, arena – the detailed dynamics in the belly of the local government beast. This entry was posted in Sustainable Energy Africa and tagged Cape Town, Energy Efficiency, Energy Transitions, Ghana, Governance, Government, Infrastructure, Local Government, Local Government Dynamics, Municipal Energy, Municipal Planning, Municipalities, Regulation, Solar Water Heaters, South Africa, Sustainable Energy Africa, Sustainable Energy Transitions, Uganda, Urban Energy, Urban Energy Transitions, Urbanisation on May 28, 2015 by danielkerrucl. Prosperity in a Rapidly Urbanising World; Where Do We Go From Here? Xavier Lemaire and Daniel Kerr from UCL recently attended a talk entitled “Prosperity in a rapidly urbanising world; Where do we go from here?” given at UCL by Dr Julio Davlia from the Institute of Global Prosperity at UCL’s Development Planning Unit. The talk was focused around the challenge of improving prosperity and economic development in the developing world whilst facing the constraints, challenges and opportunities of a rapidly urbanising world. The presentation began with an investigation of the causes of modern urbanisation in a sociological sense (in terms of modernisation theory), and also from the point of view of development economics, including the Harris-Todaro model of rural-urban migration, and examining the pull and push factors that affect developing countries (for example, greater employment opportunities and higher wages in cities compared to rural areas). Dr Davila went on to highlight a number of correlations in the field of urbanisation and prosperity. Strong positive correlations exist between the proportion of population urbanised in an economy and GDP per capita in the country, as well as with life expectancy, rising with the urbanisation rate. Strong negative correlations also exist with child mortality and urbanisation. However, an interesting implication particularly for municipal governments is that tax revenue as a percentage of GDP offers no correlation with an increasing urbanised population. Instead, recovery rates are mostly flat as urbanisation increases. This has significant impacts for municipal governments: with rising urban populations and a flat tax revenue growth rate, the provision of urban services will become more difficult. A common case study in urbanisation and development is that of Medellin, Colombia. The municipal government of Medellin pursued an innovative approach to the growing urbanisation and pressure on urban services in the city, pursuing formalisation activities contra to new builds and relocation. Space upgrades and the maintaining of the social fabric that had arisen in the cities contributed to a sustainable urbanisation for the city. 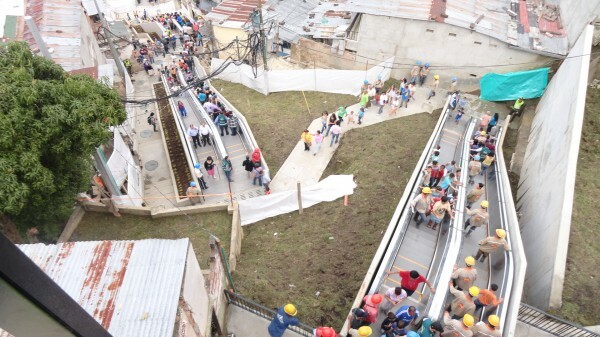 Mass transit and public rapid transit have been focuses of the municipal government, for example in the construction of escalators between the hillside formerly-informal settlements and the central business district. The formalisation activities have also greatly helped with public buy-in, and public support for the government’s schemes is high. Finally, Dr Davlia returned to the issue of municipal revenue streams and the problem of low taxation returns. Control over local levels of taxation for municipal governments is a key factor for sustainable urban development, and the issue of slipping taxation revenues leading to a downward spiral of non-payment and service degradation has been touched on before in this blog. With the ability to properly target taxation to achieve the municipal government’s social and developmental goals, this spiral can be avoided, and service delivery can improve. This entry was posted in UCL - Energy Institute and tagged BRT, Bus Rapid Transit, Child Mortality, Colombia, Development Goals, GDP, GDP/Capita, Local Government, Mass Transit, Medellin, Municipal Energy, Municipal Energy Planning, Municipal Revenue, Revenue, SAMSET, Sustainable Energy Transitions, Sustainable Urbanisation, Taxation, Urban Planning, Urbanisation on February 23, 2015 by danielkerrucl. Simon Batchelor from Gamos writes on smart energy grids, encouraging energy consumer engagement in Africa, and the concept of the “smart consumer”. 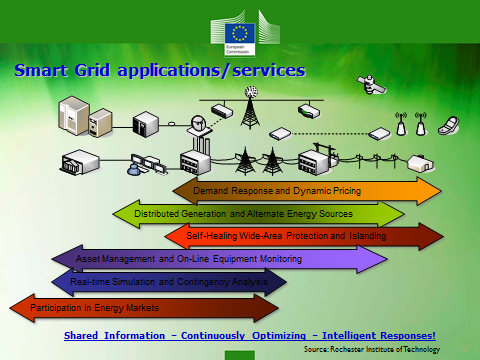 It is very interesting reading the European Union’s goals around energy, and in particular the ideas around Smart Energy Grids. They draw a lot from the works of Rochester Institute of Technology, which has produced the following diagram. Could energy consumers in Africa become smarter? There is a move within Europe to make people more aware of energy, and for consumers to make more active choices in their energy consumption. In general terms, researchers talk about how electricity provision has traditionally been a one directional and always on model. European households sign up to a utility, and expect electricity to be available whenever they want. In the UK, for instance, they often pay by direct debit (i.e. they don’t really think about the cost – it goes out automatically from their bank), and 63% of them never switch suppliers. They ‘receive’ electrical energy, and the majority just don’t really think about it. When it comes to transport, this is a little more on the top of the mind. Households may spend considerable time choosing whether to travel mainly by car or commute by train, or bicycle. While the style of the car, and the speed and space it provides are the main criteria when buying a car, most households will at least consider fuel consumption as part of the discussion. However, when talking to EDF at ICT4S 2014, an electrical utility that provides for 5 million people in UK, and most of France, they are talking more and more about a model where the household is seen as a manager of energy. Indeed they are trying to shift their thinking from a one direction model to a more complex multi directional model. The idea is that households can become more aware of their energy consumption, and even adjust their demand to ‘fit’ the supply. They can also become co-creators of energy in the system. For instance, households in UK are installing solar panels on their roofs. Policy instruments such as ‘Feed in Tariffs’ have made it financially attractive for households to install solar. This makes them co-creators of the electrical supply. On remote Scottish islands, communities are supplied with a mix of locally generated energy, both large scale wind and micro scale wind and solar, with a grid based backup. In this setup, if consumers use devices at a particular time of day their demand ‘matches’ the supply, and the system is more efficient (and produces less carbon dioxide). This is more than energy efficiency as such, i.e. installing energy efficient light bulbs, which is a passive response that saves energy. What the utilities are now talking about is an active engagement of consumers and helping people graduate through passive energy efficiency to active energy co-creation and management. Is this shift in thinking at all relevant to Africa??? In Europe much of the discussion about being active co-managers of energy relies on Information Technology – installing smart meters that the consumer can watch and sensors to make ‘smart’ buildings. On the surface it may seems ridiculous to ask whether energy consumers in Africa can utilise ICT and manage their energy. Urban dwellers are constantly struggling with load shedding, they do not have ‘always on’ reliable electrical supplies – they are very aware of the supply and their own consumption. For cooking they have to purchase charcoal, wood or LPG, and are therefore already making active energy choices. For transport they often have few alternatives, they have to use whatever public/private transport is available and they cannot afford a car (let alone choose a fuel efficient car). But as I listened to these European utilities discuss how to change passive consumers into active co-creators, I began to wonder whether Africa actually has a better starting point. Consumers are very sensitive to fuel and energy pricing as it is often a large portion of their household expenditure. They already attempt to manage their energy consumption due to the costs. They are not like UK ‘Direct Debit’ consumers – rather they ‘feel’ their energy bills when they are connected, and they are constantly seeking alternative fuels when they are off grid. Is there something African policy makers can do to leapfrog Europe and help citizens engage more directly with energy planning, to avoid creating ‘one directional’ utility provision? 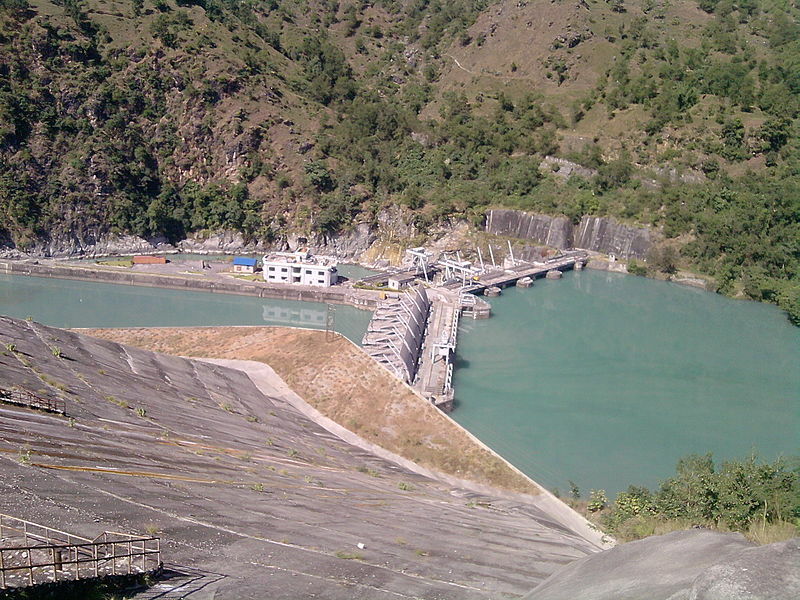 This entry was posted in Gamos and tagged Africa, Building Energy Consumption, Energy Co-Creation, Energy Efficiency, Energy Management, ICT, Knowledge Exchange, SAMSET, Smart Cities, Smart Grids, Smart Metering, Smart Technologies, Sub-Saharan Africa, Sustainable Energy, Sustainable Energy Transitions, Transport, Utilities, Utility Models on January 17, 2015 by danielkerrucl.